There's the sin and then there's the saviour. A little bit of sin for the soul becomes the saviour, a little bit of poison becomes the nectar for health. Just like small quantities of alcohol, and good fats. 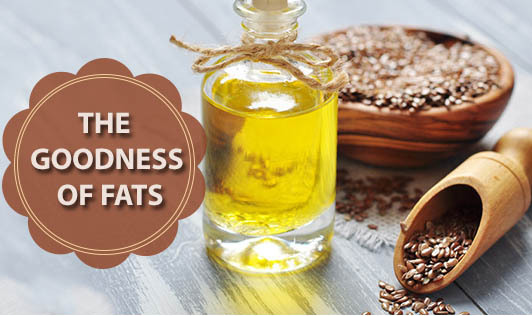 Good fat, available in oily fish, olive, mustard, flaxseed oils, nuts and seeds, protects our hearts by raising HDL, the good cholesterol. It keeps our brains calm and less jittery and helps regulate hormones in girls and women, hence keeping chances of putting on weight via hormonal imbalances away. Good fats keep PMS at bay, and can keep the flow of happy hormones and chemicals in the brain in full flow. It is essential that we consume the good fats, and that 10-15% of our total calorie intake should come from them. This is to help absorption of fat-soluble vitamins like A, D & E and making of vitamin A from beta carotene, as well as absorb and transport fat soluble vitamins to various parts of the body. Without good fats, your weight loss program may be useless too, especially if you're a woman. In children till the age of eight, while saturated fat actually provides the foundation for higher brain development (hence butter is essential till then for kids), after this age, it starts getting converted to fat. Remember how most girls at 9 - 10 start putting on weight? It's because they need the saturated fat till eight, and unsaturated fat after that (to regulate pre-puberty hormones). If hormonal balance is not maintained, girls and women put on weight quickly. But an important point to remember? Finally, all fats have high calorie content, and if you don't burn what you ingest, your weight will go up, as will your risk of developing diseases in the long run. Polyunsaturated fatty acids are liquid oils. They increase the good cholesterol, HDL, that protects the heart. Other good fats are Omega 6 and Omega 3. Omega 6 is present in fish oil (EFAs) and is called linoleic acid, while Omega 3 is gamma-linolenic fatty acid, present in Primrose oil. This helps ward off PMS and inflammatory conditions like arthritic pain. Monounsaturated fatty acids that are liquid at room temperature, but solidify when chilled. We can reduce the risk of heart problems if we replace saturated fats with monounsaturated fats as the latter reduce LDL and increase HDL. They also appear to reduce free radical damage, associated with ageing, some types of cancers, heart disease and rheumatoid arthritis. Good sources include olive oil, rapeseed oil, nut oils like groundnut and hazelnut oils, nuts, seeds and avocados. Omega 3 fatty acids are polyunsaturated acids and include linolenic derivatives. These reduce the risk of blood clotting and hence, heart attacks and strokes. They also help control inflammation and hence help against inflammatory diseases like arthritis. Good sources are from oily fish like mackerel, salmon, sardines, dark green leafy vegetables like spinach, kale and walnuts, linseeds, pumpkin seeds and soybeans. So go ahead. Get a lil bit ‘o extra virgin olive oil smeared on that toast... and watch your heart get healthy, hormones smoothen as silk and a few grams actually disappear!